Why Party Registration in Virginia is a Horrible Idea (or The Swamp Fights Back!) | Virginia Right! Here they go again. Republicans just keep earning the nickname “The Stupid Party” year after year. And make no mistake, the push for party registration is a flat out GOP Establishment (GOPe) scheme to exert more control over the election process. But this year, State Senator Mark Obenshain is counting on the bitter Cruz Clingers (i.e. The Christian Taliban) to be enraged enough at the Donald Trump victory to push Party Registration on the Commonwealth. Never let it be said that the GOPe is not good at manipulating their emotionally handicapped brethren after a loss, when they are most vulnerable. But those that are still burning after the bitter primary loss are not thinking clearly. As “Gollem” Obenshain holds out his Senate Bill 902 to thrust Party Registration on Virginians, it is a shiny object that is offered as a balm against the still stinging primary wounds and the election of Donald Trump. Mark Obenshain has endorsed Ed Gillespie for Governor in 2017, and you don’t get any more establishment than “Enron” Ed. And while this bill will not effect the 2017 elections, it will impact (if enacted) the 2018 US Senate race for Tim Kaine’s seat as well as the 2020 Presidential election. There are a lot of Republicans in power who fear growing the party. Their preference is to be the top dog in the loser field than a member of the masses as a winner. The GOPe spends more time trying to purge those that have a disdain for the establishment and the $20 Trillion they have put on the backs of taxpayer’s. Rather than take advantage of the massive influx of Republican voters, many of these “Republicans” are expending extraordinary amounts of time and energy trying to purge the non establishment Republicans from the party. Party before People is their motto. Some are still plotting for the return of yesterday’s dinosaurs like Eric Cantor. And the Bush family. They can see their grip on the “good ‘ole boy” network slipping away as energized Trump supporters rose up to change the direction of the country. Party Registration is like an anchor holding us back. And trying to bring back the lobbyists and big money that control the party, though to a lesser degree. Party Registration offends people who have grown sick and tired of the grand OLD party. And it drives new members away. Away from the party and away from the polls. Party Registration is all about controlling the voter. And their vote. So what Obenshain wants to do is force you to declare yourself a Democrat, Republican or Independent. And if you do not choose one, you will be assigned a party: Independent. So what happens when you want to bid on a government contract in, say, Fairfax County. In this ever so blue County, all they authorities have to do is peek at your party affiliation. Or for building permits. Or any other action for which you require government approval to accomplish. Will judges look at your party affiliation? Business customers? Will you suffer a boycott simply because the left knows you are a Republican and they are angry at something Republicans do to cut down on abortions? Or gay marriage? Or perhaps the anger the left has for anything Trump will be visited on you or your family in a form of violence because you are a Republican. Not knowing (or caring) if you are a Trump supporter. In the 2013 Legislative Session, State Senator Obenshain introduced SB 1335 which was a bill to make Concealed Carry Permit holder’s names and information private. There were many reasons to do this. One was to prevent burglars from knowing which homes may have guns. Other reasons were to prevent the liberal media from publishing the names and addresses of permit holders. So in 2013, Obenshain was concerned about privacy of government records. And while guns and party affiliation are not apples to apples, the underlying privacy concern is. Some information is considered sensitive by some people. What right does the state have to know what party you support? The usual argument for party registration is that the Republicans don’t want Democrats picking their candidate. But what most of us involved in politics have seen is that those in power at every level are just as interested in keeping the people who are truly Republicans out of the process if they are supporting a candidate the party officials do not want. Quite a few people have been refused their right to vote for one reason or another. A statement about a non Republican candidate will get you kicked out of the party and most of the rules are ambiguous and open to interpretation (and shenanigans) by Units and the Republican Party of Virginia. This is one section of Obenshain’s Bill. § 24.2-516.1. Party to notify State Board of persons qualified to vote in primaries. A. By January 31 of each year, the state party chairman of each political party shall file written notice with the State Board applicable to the primaries to be conducted by the party from April 1 of that year through March 31 of the following year. The notice shall state the rules adopted by the party for participation in the party’s primaries, including whether the primary shall be (i) open only to qualified voters who are registered as being affiliated with the political party, (ii) open to qualified voters who are registered as being affiliated with the political party and to qualified voters who are registered as independents, (iii) open to all qualified voters, (iv) closed to qualified voters who have participated in another party’s primary within a stated period of time, or (v) limited by such other rules for participation that the party determines to adopt and that are permitted by law. The state party chairman’s notice shall apply to all primaries conducted by the party, including statewide and other election district primaries. B. The primaries shall be open to qualified voters who have registered as being affiliated with the political party and as independents if the state party chairman fails to provide to the State Board the written notice required by subsection A. Note the portion I highlighted in bold. So not only are we looking at simply party registration, but our right to vote in a party primary must also follow all the rules adopted by the party. This may include mandatory poll tax (party dues) and exclude anyone that has participated in a non Republican election event for 10 years, or whatever time period they adopt. Or anyone that has registered as a non Republican in the last decade. Or ever. So a seemingly benign party registration could disenfranchise anyone who fails to declare their fealty to a party and is auto assigned Independent. Which might disqualify them for as long as the party decides. Many of the Party rules the Republicans have adopted over the years tend to empower the leadership and punish those that do not blindly follow, or question authority for morality’s sake. So according to this Bill, who may vote in a Primary is determined not by the Constitution, and not by the State or Local registrar, but by the Political Parties. A massive consolidation of power taken away from the people and delegated to a political party. And we should pay attention to this section too. All persons qualified to vote, pursuant to §§ 24.2-400 through 24.2-403, and § 24.2-516.1 may vote at the primary. The primary shall be conducted, as specified pursuant to § 24.2-516.1, in accordance with the notice of the state chairman of the political party holding the primary. No person shall vote for the candidates of more than one party. §§ 24.2-400 through 24.2-403 deal with registration of unregistered citizens and moving into or out of the area. § 24.2-516.1 is the section quoted above. Note that is it mentioned twice here. So in essence, the candidate we are allowed to vote for in November will be the one the Party leaders and those who make the rules put in play. This will lead to more Eric Cantor’s and fewer Dave Brat’s. We will see more Jeb Bushes and fewer Trumps (and Cruz’s). This Bill is slating on steroids. We lose our privacy, our ability to select the most popular candidate and quite possibly, our vote. All at the whim of the current person in power when they adjust the rules. If we are going to register by party, something I am not totally opposed to in concept, we must ensure that the only stipulation for voting in a primary is that the voter is a registered member of the party having the primary. It is absolutely unconscionable to allow a party to set rules and hoops for the public to participate. Being registered should be enough. We simply cannot allow the party to put their thumb on the scales by setting the rules. And if we must register by party, the registrations must be totally private with harsh penalties for releasing the information. I have been given spread sheets to make calls from campaigns that included a great deal of personal information, including Social Security numbers. This bill is not what we need in Virginia. If we must register by party, the party must be removed from the rules process. This is a budget buster for county registrars. 2016 was a very expensive year for county registrar budgets. Contacting 8.5 registered Virginia voters to ask them to declare a party and dealing with the phone calls when voters realize they want to vote in the June 2017 Primary extra staff will be necessary at the county and city levels. With the VRS underfunded by billions and Virginia’s debt mounting you would think Obie would be more fiscally responsible. And HE wonders why the Republicans have LOST VIRGINIA? 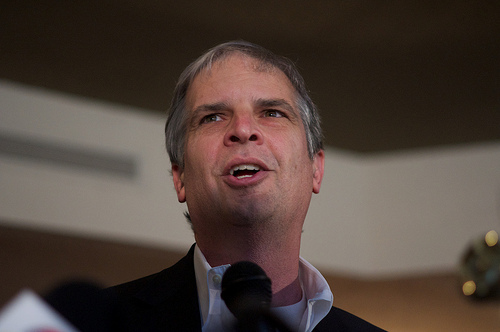 This is why Mark Obenshain lost his bid for Attorney General in 2013. Wife Suzanne Obenshain lost her campaign for National Committeewoman to grassroots conservative Cynthia Dunbar in 2016 and daughter Tucker is working in a cubicle at GOPe lobby tank McGuire Woods. Obenshains aren’t grassroots conservatives- THEY ARE ESTABLISHMENT shills and Virginia Republican voters have rejected them wholeheartedly. We know who they really are. Thanks Tom! We need to be reminded from time to time with a Gut Check. And not one of the Bull Elephant writers ( who all support Conventions vs. Primaries) were savvy enough to understand what Obenshain’s bill really does: slates off grassroots independent voters from serving as delegates to GOP Conventions- PARTY CONTROL. Good post. You are right. Party registration means the end of primaries. Me thinks she drinks too much. Love your used name except I’d put Jesus first and then sweet tea! The Democrats love the GOP establishment, they are one in the same. Voting for a member of the establishment is like dying from a thousand cuts. They are the swamp in VA and must be defeated. If you think a Democrat is worse you need to take a closer look. In the long run they do more damage than the Dems. You are exactly right. Problem is? Trump is the establishment. We’ll see, I hope I am wrong. Every establihment politician, Democrat, the media, and 90% of Hollywood have been and are against Trump and you say he is establishment? What on earth do you read? There has been no one as non establishment as Trump. The establishment is so entrenched and the damage they have created will take a monumental effort to turn it around. Who knows whether or not Trump can do it. One thing is certain and that is there wasn’t a single GOP candidate running and that includes Cruz that would have been able to reverse the travesty we have inherited during at least a half century. You are undoubtedly a Cruz supporter and a never Trumper. You need to let go of your obsession with Cruz. Trump has done more before he enters office than any presidential politician I have witnessed and I have been following politics for over 50 years. If you had read my comments during the last year you would know that in my opinion Cruz is a Goldman Sachs puppet. We will see if Trump does what he said he would. In my opinion, it ain’t looking good so far. I did not vote for either Trump or Hillary, not going to happen. In my opinion, billionaires are establishment. One the first things Hillary did as SOS was a Russian “reset”. Their response was to invade Crimea. And now, Trump wants to do his “reset” with Russia. Communist China, Russia, Israel, all need to get back inside their own borders. Trump will get nowhere kissing these people’s asses. A no vote for Trump was a vote and it was for Hilary. Had she won there would have been no turning the country around short of insurrection/anarchy. I too have not voted for establishment politicians and have actually voted for a Dem. My vote for Carter turned out to be one of my best votes. Had Ford won he would have run another term and we would not have had Reagan. Getting back to your comments, I must asked who would you vote for? Chose a name. Since no two people agree on everything how in the world could any politician please you or any purist? It’s a big diverse country so what requirements would satisfy you? A vote for either Trump or Hillary was a vote against my write in. Trump and Hillary are both pathetic liars. And, Trump is continuing to use what got him there. Nothing but lies. No long term good wouldl come out of this, no matter which liar won. We are in big trouble because we cannot produce a better candidate than those two, or, the other 18. If Corey Stewart can’t pull off the Republican nomination in June as a populist, then Ralph Northam MUST become the next Governor of Virginia! Ryan McDougal with a GOP controlled House of Delegates under Lobbyist Governor Ed Gillespie, provides NO checks and balances to prevent corruption in a General Assembly that refuses to consider ethics reform and the UNIPARTY win takes it all. Voters all across Virginia agree the GOP without checks and balances is completely corrupt. The General Assembly controlled by Republicans is bought and paid for by lobbyist interests. Who supports Ed Gillespie for Governor? Only those professional politicians elected to the state senate and house. Virginia would be better off with Northam if the Republicans continue to rule with in your face impudence like Obenshain. and I’m a Republican who voted for Trump TWICE, Mr. Trump Watcher. this lawsuit against Ed Gillespie and Karl Rove proves Ed Gillespie doesn’t have any more scruples than Bob and Maureen McDonnell Governor Gillespie? yeah right.